A decaying deco hotel set in a dystopian downtown Los Angeles creates a swirling backdrop for a random story of redemption anchored only by Jodie Foster’s persistent talent and Dave Bautista’s hulking presence. There’s a candle burning in the window of Hotel Artemis, and no Keanu. So leave all expectations of The Continental behind before you check in, because if you’re looking for John Wick’s tapered look around the corner of these accommodations, better to snuff your hopes out now. Hotel Artemis shares a lot in common with the fictional inn occupied by Keanu Reeves’s paid assassin. Namely, anonymous, no-questions-asked safe harbour for particularly rich and well-connected criminals. Yet, this hotel is a 1920s damsel in 2020s distress. 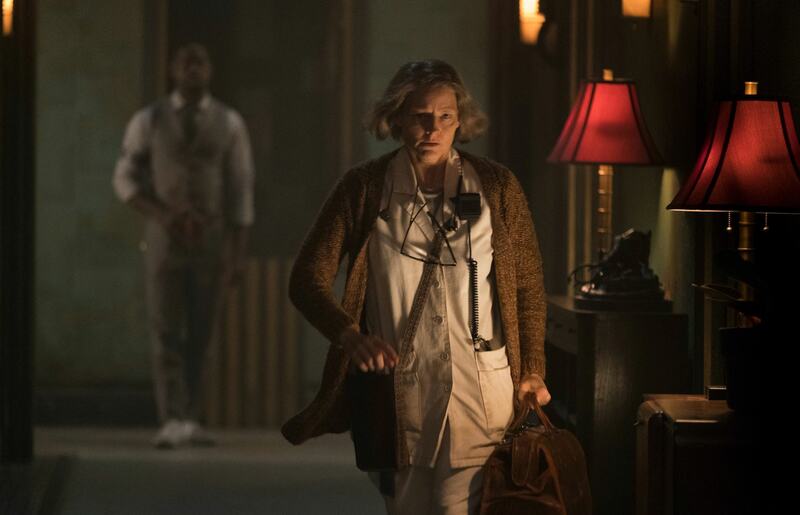 A deco masterpiece subjected to the ravages of the not-too-distant future, where water shortages have turned the masses into a riotous mob, Hotel Artemis keeps its doors bolted tight against the world. Access is reserved for those with membership. And membership is granted only by the hotel owner — a man named the Wolf King. We don’t see the owner early on. We only see The Nurse (Jodie Foster), a woman who wears earphones and listens to Buffy Sainte-Marie’s Helpless as part of her 1970s-inspired sonic loop. Director-writer Drew Pearce says he saw the Nurse as a “lady from the Canyon type,” and native Angeleno Foster understood exactly what that would look like. She finds the unspoiled, idealistic heart of the character and moves outward from there. It’s only when her fingertips hit the edges of the walls, and creep around the sill into the outside world, that she recoils into her emotional carapace. She is a good person surrounded by career criminals. Yet, she seems to find a great deal of pleasure — or perhaps, a great sense of purpose — in helping those with bleeding gunshot wounds and a personal portrait displayed on “wanted” poster. She would seem to be completely vulnerable. Yet she maintains complete control through the most chaotic of situations by using her intelligence, her secret hotel assets, and her close connection to Everest, the most seductively intimidating bouncer/medical technician ever to appear on screen thanks to Dave Bautista (Guardians of the Galaxy). The two of them make a dynamic duo. They’re also the mortal portal to this den of sin. Everyone else has checked in to their own version of Hell, but the Nurse and Everest haven’t entirely fallen. They work and live at the hotel owned by an evil force, but they remain morally poised despite the chaos that surrounds them. Pearce creates a vortex by making the outside world so unstable, it’s like a black hole sucking the entire Artemis into its collapsing core. He also offers all the requisite science-fiction nods — Blade Runner’s dystopian take on a future L.A., Alien’s use of shadow, Star Trek’s medical accuracy — to enhance the sense of a hermetically sealed ship, drifting into the darkness with a small crew of survivors. Pearce creates a vortex by making the outside world so unstable, it’s like a black hole sucking the entire Artemis into its collapsing core. To extract the most from this dense core of story, Pearce needed to develop and refine the characters to ensure their interactions create real chemistry. If you’re lucky, you create a chain reaction and a narrative that easily fuses. Pearce gets a few crackles and pops thanks to the production design and the cast’s full-on commitment, but the potential energy of the intriguing premise is never realized. Hotel Artemis, like The Continental, is a blend of private club, luxury penthouse, and gilt-edged limbo. People live in a state of suspended judgment while they have a guest key, but the outside world and a greater reckoning await. We watch them either make peace with their fate, or rage against the inevitable with barrels blazing. Combine the moral edge of the guests with the soft skin of the Nurse, and you’ve got plenty of suspense from all sides, but Pearce never seems to have a narrative destination in mind. As a result, we never quite know what each character really wants or needs, and the denouement begins to feel a little random. It’s also missing an element of true fun. Sinners are the ones who know how to have a good time. Tragically, we’re missing a good bar scene, or any other source of easy unveiling. The characters feel trapped in the hotel, and stuck without any real purpose. The Nurse certainly finds a backstory and a deeper motivation, which Foster articulates through her thoughtfully mechanical body language. Yet, the muscular peaks of Everest are never fully scaled, and the majority of the other frame occupants — including de facto lead Sterling K. Brown as Waikiki and Zachary Quinto as the menacing son of the Wolf King — leave us scratching at the pretty surface. Without a deeper sense of character, Hotel Artemis remains a little too anonymous to be truly memorable.Yet, thanks to Foster, Bautista and the brief appearance of an eerily youthful Jeff Goldblum, Hotel Artemis offers enough surreal scenery to merit a tour of the lobby — if not a fortnight at the fort. No Replies to "Check In at Hotel Artemis and Visit Hell"